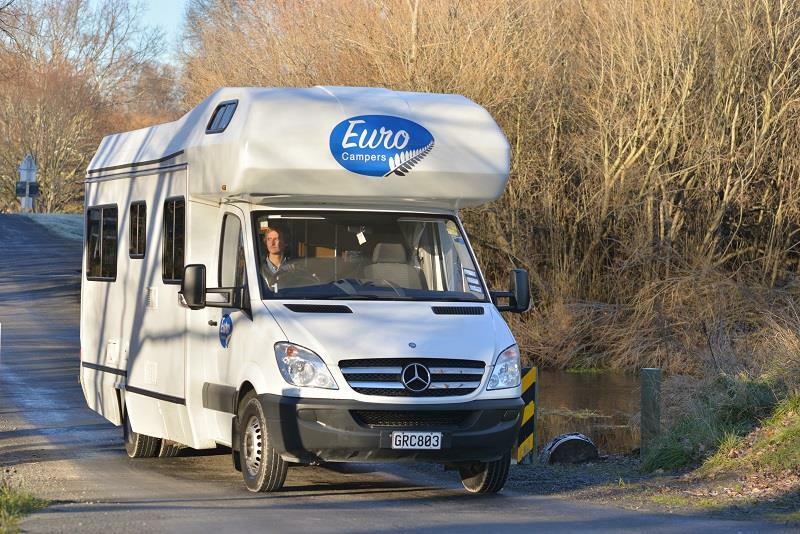 Euro Campers is a campervan hire company in New Zealand with depots in Auckland and Christchurch. They are just one of 3 brands run by a parent company. Budgy Campers is the budget brand, Euro Campers is the mid range and Heron Campers are the luxury brand. All campers are certified as self-contained across all 3 brands. 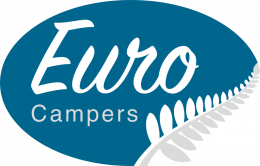 The Eurocampers founders are a pair of ex-patriate Germans who worked in the campervan industry for other companies before establishing their own brand. 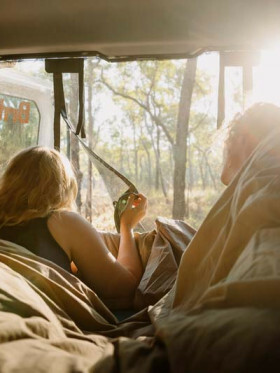 They are seasoned travellers who also staff their company with other seasoned travellers so they know how the renter feels when taking out the camper and what they are looking for. Their biggest theme is that they have a "One Price Package" that includes, amongst other things, GPS, wifi and an internet connection. In addition to this we like free airport transfer, no one-way fees and best of all free windscreen replacement and underbody and roof coverage - very few companies are doing this! The fleet of Euro Campers are classified into Budgy Campers, Euro Campers, and Heron Campers. They have two vehicles for Budgy Campers, five for Euro Campers and three for Heron Campers. Beddings and towels are also included in all campervans and motorhomes across the 3 brands. 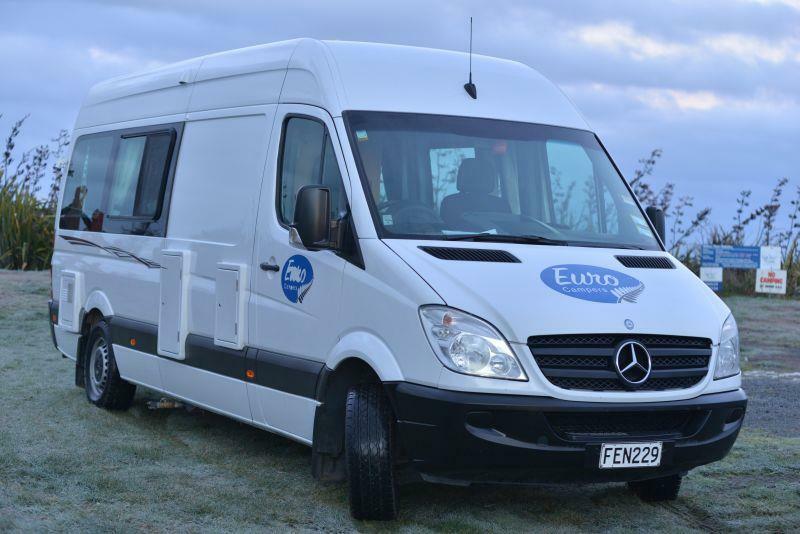 The claim to fame for this sleepervan is that it is the only certified self-contained sleepervan in New Zealand. We are yet to come across another at the moment of writing so good on them! 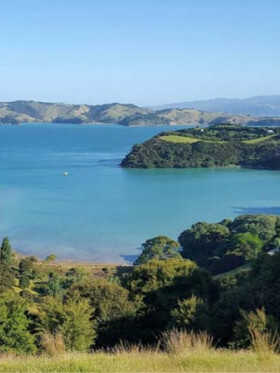 Being certified self-contained in New Zealand opens up a larger range of freedom camping sites to the renter. So, the campervan has a black water tank, grey water tank and a fresh water tank that should last you 3 days at least. The setup is pretty standard with the kitchenette in the back, accessed by opening the rear door. All the sleepervans are 2001-2005 models, so they are a little on the old side, but all had a makeover in 2015. You can still expect a little wear and tear despite the make-over , but we do love that all models are auto transmission. The inclusions are pretty dang good with Eurocampers, not just the sleepervan but across the whole range. The only real downside is a 1.4m wide bed for 2 people. In the next model up, the hi-top, 1.4m wide is listed as a single bed! Overall though, if you are looking for budget sleepervans this company ranks higher than the likes of Lucky Campers that have similar aged vehicles. Recommended for those on a budget and are thin. Expect a lot of miles on the clock. The 2+1 berth campervan is quite a stock-standard hi-top campervan. 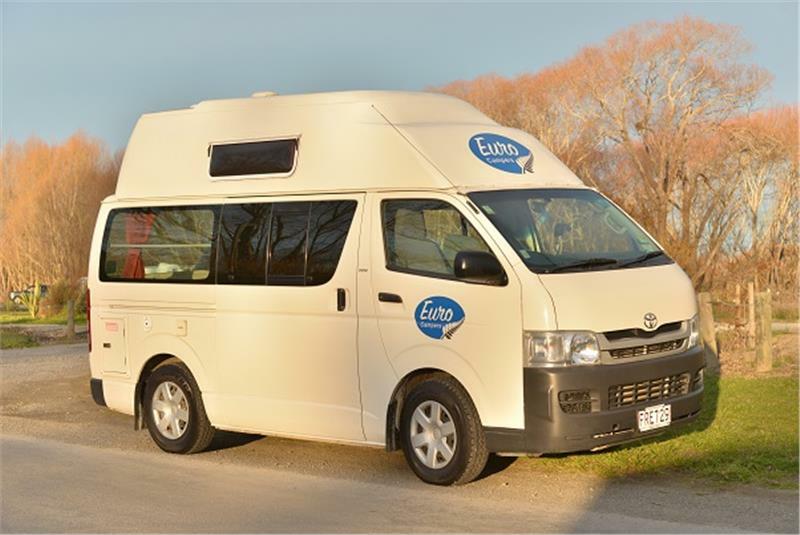 Ranging in age from 2005-2010 they are getting a little old and you can expect quite some miles on the clock, but good maintenance is the way of Euro Campers so you can expect the interior to be quite liveable. Wear and tear is inevitable though, so you can also expect some of the minor things like some freying on cushion stitching, stains on curtains and the like. The campervan is a manual transmission, which is a bit boring, but is again pretty standard and makes up for this minor flaw by being another fully self contained vehicle. The black water capacity is a bit small at 10L, but regular emptying is probably a good thing anyway, right? Grey and fresh water are acceptable at 60L and 55L respectively. A child seat can be fit in the middle front seat. Being a manual transmission this would be awkward and lucky that this can be done in New Zealand - in Australia it is illegal to put a baby seat over the top of an engine. 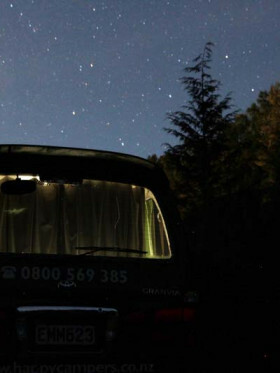 Overall, this campervan is fairly run of the mill by itself, however it is the Euro inclusions that again mean it is well worth a look at when pricing your road trip. Now we move in the motorhome models of Euro Campers. We are now talking about the apartment-on-wheels size and standards with 3 beds (double up high, double at the back and single just behind driver), 4 burner stove, built in toilet/shower 2 different tables to sit at, fridge/freezer and kettle. When plugged in to power there's also the microwave and air-con too. Built on Mercedes, this is a very nice motorhome. The layout is pretty standard but the swivel captains chairs to face up to the dinette table is not all that common. The down side of this is that only 4 can really sit around the table - but realistically if you want 5 around a table, you'll go to the larger table at the back anyway. The camper is Diesel, as are most at this size, so in other companies would attract the (rather stupid) RUC tax where you are taxed for every 1000km you drive. Euro have simplified this and don't charge extra for the RUC. (if you want to know about the RUC go here). There's plenty of storage both inside and underneath the motorhome and the toilet is quite a generous size. 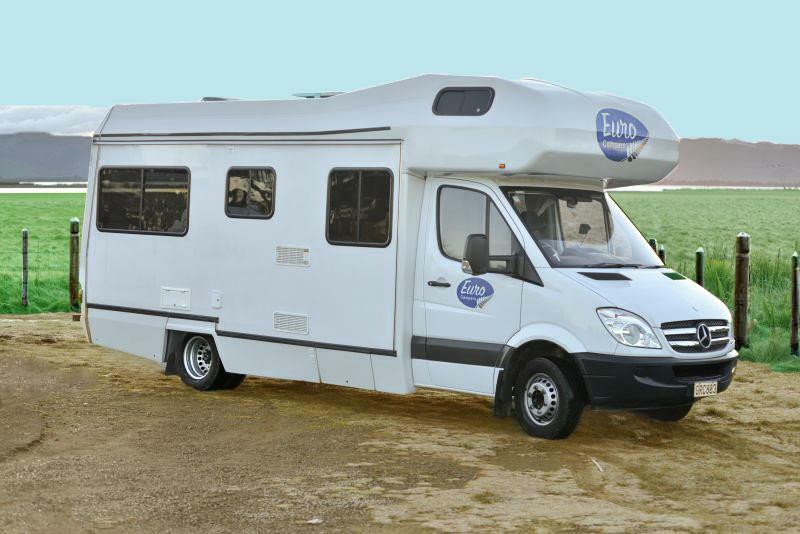 Overall, this is a nice motorhome and is well worth putting in to a pricing comparison that you may be running. Recommended due to the inclusions of Euro Campers. A different layout from most 6 berth motorhomes makes this model a much better ride for the rear passengers. Most motorhomes of this size have the 4 rear passengers facing each other, meaning 2 go backwards. In this model the side door has been moved further along the body and a forward facing seat put in on the passenger side. The drivers chairs also rotate around so all 6 peeps can have a little chin wag in the front part of the motorhome rather than just as the back table - over a long term road trip this motorhome it will be nice to be able to move around a bit like this. The rest of the vehicle is pretty standard and is the same as the 5 berth. I like the difference in this model, mainly because if you've got 4 kids coming along you can A) separate them to stop them fighting and B) they can all look forward out the window and see what's coming. Recommended as something different and because of the Euro Campers inclusions. The Rental Agreement or Confirmation Letter of Euro Campers already shows that the insurance is in full amount. 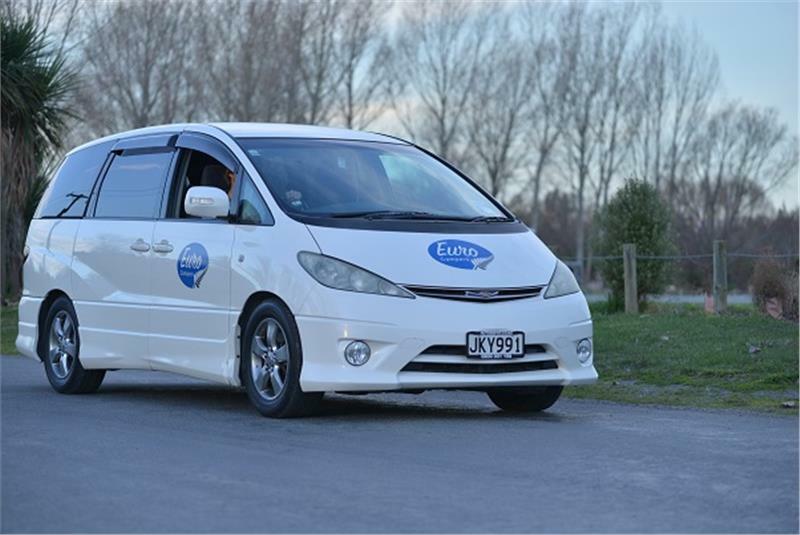 The liability excess is NZD250 for all vehicles except for Euro Familia and Heron vehicles which have NZD2500 liability excess for drivers under 21 years old. 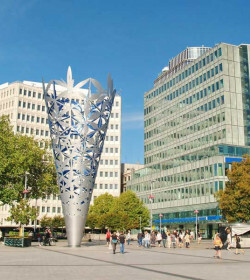 Reviews for Euro Campers mostly show the positive reactions of travelers towards their services. The company is mostly praised for their staff who give satisfactory services and help whenever it is needed. Their campervans get good feedback as well for being clean, modern, and well equipped. However, other travelers can’t help but notice the age of some of the campers as they can see through the changes done to improve them - you can't please everybody I guess. The ratings for Euro Campers may not always be a perfect 10. But they sure do give their best when it comes to serving road trippers. Likewise, based on their vehicles, they’re the company that cares about how their vehicles look and functions. 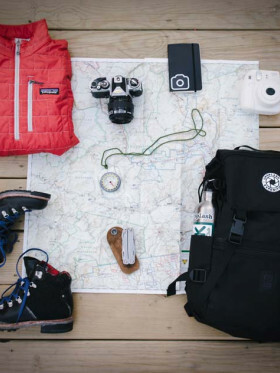 However, regardless of the efforts exerted by the company, there are still those travelers who may have wanted a little bit more out of the vehicles especially when it comes to age. Expect miles on the clock but plenty of care given to the interior living space. Overall we love this company. The inclusions are fantastic and they really do seem to care sincerely about the quality of the campervans and motorhomes. Vehicles’ layout is better than the others especially when it comes to maximizing space. Staff that give good services and ready to help. My husband and I rented a Toyota Regius Ace (Kingsleeper) from Eurocampers for 5 weeks over Christmas & New Year and we were completely disappointed! - It already started, when we picked up the van: the storage space was really narrow. We almost couldn't fit our luggage into it. Fortunately, we didn't bring a suitcase, but only travel bags. 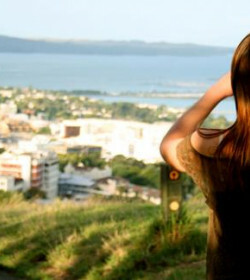 If you would have a suitcase, you would need to leave it outside, always standing in the way. When you book, Eurocampers should actually tell you about that, so that you know, what you can bring & fit into the camper. - We also thought we would have a connection for power supply in the camper, but we didn't. Most of the campers in that size actually have a connection, but Eurocampers just didn't think it through. So, most of the things, like mobile phones, you can charge through the cigarette lighter in the van, when driving. However, our camera battery not. So always, when we went to a cafe or a paid campsite, we were looking for any possibility, where we could charge our camera battery. - The cooling box was quite old and drew more volt than the cigarette lighter offered. So, our fuse melted twice and also our cable for the cigarette lighter melted. - The tyres didn't have any profile left on them. So on Christmas Eve we got stuck in some gravel. We called AA, who told us that Eurocampers is not in the AA anymore. So they could only give us a number from someone who could pull us out, but we had to pay him 200 Dollars in cash, so he would come and do that. We called Eurocampers after the holidays and after seeing photos of the tyres, they told us they were still fine (even when they didn't have any profile and we always had problems parking on gravel) and that we had to pay the 200 Dollars ourselves. - Shortly before New Year's Eve, our water tank broke, so we had to spent New Year's Eve at a workshop for 4 hours. The guy told us that there was a kink in the hose, so that's why the water or air couldn't get out fast enough and there was too much pressure on the tank, so it broke. He said, the way that everything was built in was very unprofessional and that it's no wonder it broke. In the evening we wanted to brush our teeth and recognised that now the water didn't drain from the sink. So the next day, we bought some tools ourselves and needed 1 hour to fix that. - Finally, when we gave back the camper, we didn't get any apology or refund for all our troubles and all the time we spent fixing things in the campervan. They didn't even bring us to the airport for free, because the last shuttle already left and they weren't kind enough to give us even that for our troubles. Conclusion: We had a lot of trouble and there was no cooperation from Eurocampers! So never book Eurocampers! We loved our van and it didn't give us many troubles but we are extremely glad we didn't have any serious issues as the customers service is awful. If it is going to take you 2/1/2 hours to respond to an enquiry about the van don't say you will call back in 10 minutes and then refuse to pick up the phone for to hours and respect the fact that people are on holiday and value their time. 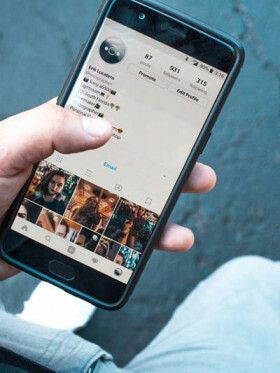 It would also be good if the Christchurch and Auckland office had the same policy on things and if the company knew how to use the Skoot App. Many other customer service issues, in short good van (luckily) but I still wouldn't rent from them again. I will never choose Euro Campers again! Horrible experience! "Euro Campers bed bug disaster"
WARNING: Euro Campers bed bug disaster und irresponsible behaviour. They gave us an infected motorhome (we found a prior customer who already complained about it). They didn't take responsibility, didn't care about the impact on our belongings and left us all alone with this disastrous situation, which ruined our holiday. To this day they refuse to pay any refund or compensation. They are either ignorant or fully aware not interested in the severity of a bed bug infection and proper treatment. We felt completely left alone, not taken seriously and treated as a pain that needed to go away as quickly and painless (for Euro Campers) as possible. We surely didn't feel like customers who just spent over 20000 Euros but are now left with financial damages in the thousands and ruined holidays and have to deal with the aftermath and legal action.